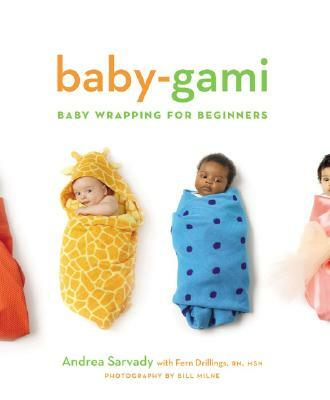 Origami meets the age-old art of swaddling in Baby-Gami and no longer does baby wrapping have to be an intimidating undertaking. Easy-to-follow instructions illustrated with step-by-step diagrams and unbearably cute photographs make it a cinch to execute flawless wraps. The first part of the book offers a variety of cocoon-like styles for newborns; the second shows parents how to create slings for "wearing" older babies. Once new parents master the basic swaddles and slings, they can branch out into more pizazzy terrain. Try the Picnic Wrap, the Glamour Sling, or the satin and tulle Gift Wrap. With advice from experts and real parents, tips on baby-carrying, baby-soothing, and a rundown of items not to wrap your baby in, Baby-Gami is a must-have for any new parent. Andrea Sarvady has written for several publications. Currently a resident of Atlanta, she has spent the past 11 years swaddling, bundling, and adoring her three kids, who are all curiously drawn to the Egyptian mummy exhibit right up the street. Bill Milne is a New York based photographer whose work has appeared in several publications and more than 20 books. Fern Drillings, RN, MSN, is a certified childbirth educator and infant/child CPR instructor. She is on the faculty of New York University School of Nursing. Fern lives in New York City with her husband and son, who was swaddled as a baby.